On the other side of the coin you have dumbest phrase of ALL TIME in “Less is More.” I can’t tell you how much this makes my back teeth ache. NO IT’S NOT!!! MORE is MORE! Less, by its very definition isn’t as much so it CAN’T be more! Now less can sometimes be BETTER than more but Less is NEVER more. One of the most often asked boating questions is “What size boat do I need to go cruising?” Well, if you pay attention to the boating and cruising magazines whose life blood is the advertising income they receive from boat manufacturers and equipment manufacturers. Your life is in imminent danger the moment you leave the dock in anything less than 45 or fifty feet of fiberglass tricked out with every electronic device known to mankind. I remember once someone describing another person’s boat saying it was fantastic because it had the “most expensive” navigation gear available. Naysayer that I am I said that NO, most “expensive” is NOT a synonym for “best.” Those same boating mags totally ignore the fact that Robert Manry n 1965 sailed from Falmouth, Mass. to Falmouth, Cornwall, England in Tinkerbelle a tiny 13.5-foot (4.1 m) sailboat. or that Tania Aebi did a solo circumnavigation in a 26′ sailboat when she was 18. Between 1955 and 1959 John Guzzwell sailed solo around the world in a boat that wasn’t quite 21 feet long. And “cruising” DOESN’T have to entail great ocean crossings. Taking your boat and going to a little cove you’ve never been to before is going cruising. And here’s a truism most people aren’t aware of: “Boats are used in inverse proportion to their size!” That is, the smaller the boat and the easier it is to use then the more it WILL BE USED. So, what got me started on this rant in the first place? Well, I’ve once again been bitten by the “I need to have a shanty boat bug!” And I’ve been pouring over old articles I’ve saved and scouring the internet for new inspiration. And last night I saw this neat thing. It’s LaMar Alexander’s 8×12 Stealth-boat Tiny House Design. The VERY FIRST THING that crossed my mind was, “with just three more sheets of plywood you could extend it to 8X20 feet and have a lot more room!” I mean that was my instant reaction, and it’s really not wrong, I don’t believe, if you’re making something that you intend to live on. An eight by twelve foot shanty like this would be a great weekender or fine for a short vacation, but I really believe if you’re going to spend much time on it you need to make it AT LEAST 16-feet long but I wouldn’t go over 20 because of cost, weight, time to build, etc. Just be wary of where you brain leads you. It’s going to automatically make you want to go bigger. I’ve decided that I should build a pontoon-type boat, doing it in four-foot segments (possibly eight-foot if I can be sure to divide that in half with a leak-proof bulkhead. These segments would be built here at the house in Boquerón and then trucked down to the marina in Pedregal where they’d be bolted and epoxied together. I have a LOT of experience with thickened epoxy as a bonding agent and I KNOW that the wood around the epoxied joint will give way before the joint will. The pontoons will be 2-feet wide by 2-feet high, and between 24 and 28 feet long. Probably the latter. The beam of the boat will be 10-feet, with the house being 8-feet wide allowing for a nice roof overhang, or whatever that’s called in carpentry terms. One gallon of water weighs = 8.3453 pounds. One cubic foot = 7.48052 gallons. The weight of one cubic foot of water is 7.48052 gallons times 8.3453 pounds, which equals 62.42 pounds of water per cubic foot. OR, it would take 62.42 lbs. 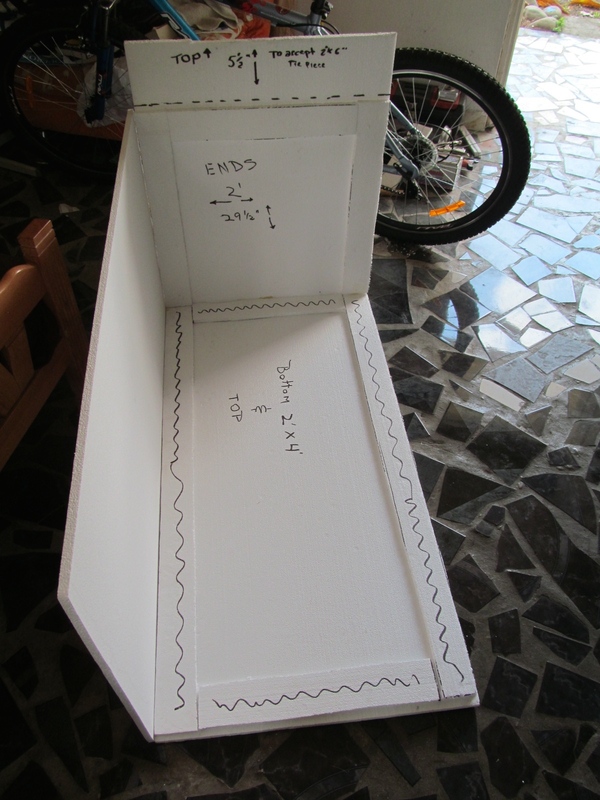 to completely sink a cubic foot container. SO, 62.42 lbs X 16 cubic feet = 998.72 lbs. displacement for each 4’ pontoon. Minus the weight of the materials each pontoon will support, roughly, 900 lbs. The sections in the bow would be made like the bow of a barge or scow, sloped up from the bottom to move through the water with less resistance. Figure that each one of those will be roughly half the volume of the regular one for a 28’ long structure overall, or roughly 11,700 lbs. flotation. Whatever kind of house structure I build on top of the pontoon segments plus all the junk that I’d bring aboard certainly isn’t going to amount to five and a half TONS! Now, a 55 gallon drum measures 35” X 24”. A 55 gallon drum will displace 459 lbs. Because of the odd measurement of 35” you’d need 10 drums to make up each pontoon of a similar size to the plywood pontoons. Now you’re mucking around with non-standard size lumber or going for 10 barrels a side. The cheapest 55-gallon plastic barrels I’ve found around here cost $30/each (can’t find a source for used barrels like in the States because if they are available they’re snapped up instantly by people who use them for water storage.). That’s $600 for flotation. And how much flotation? 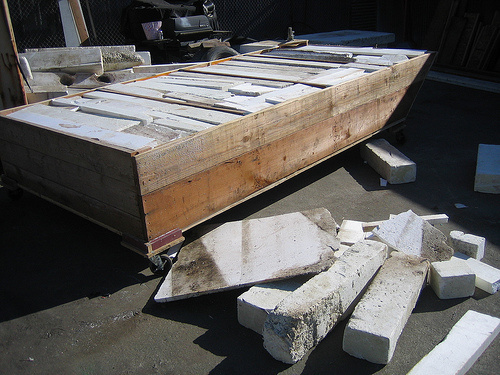 Potentially 9,180 lbs., before deducting the weight of the materials needed to contain them. So more than a ton less flotation than the plywood pontoons. I tried drawing these pontoon segments out on paper, but it wasn’t very successful, everything in 2-D. 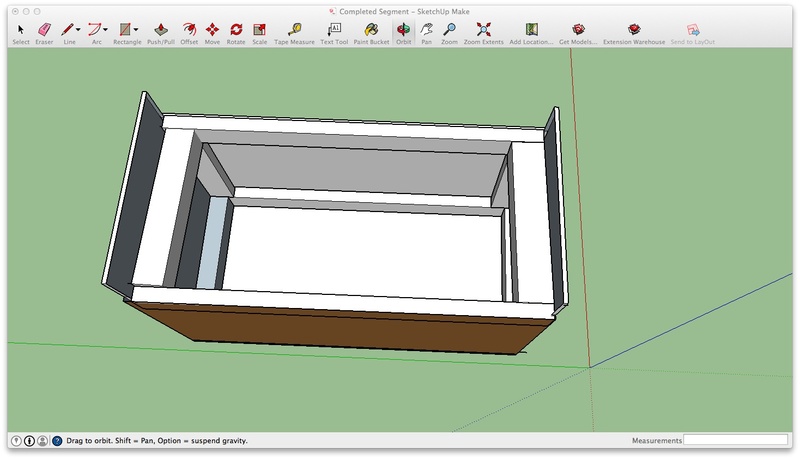 So I downloaded the free SketchUp design program and found out there’s a HUGE, STEEP learning curve and the frustration level was almost more than I could bear. 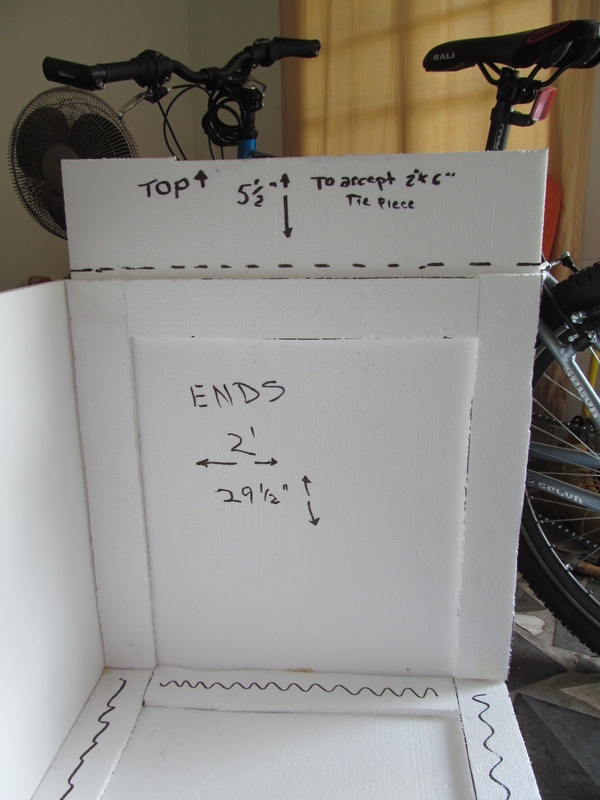 So, one Sunday morning last month I went into David (Dah VEED) to the store where I knew I could get 2′ X 2′ X 4′ styrofoam drop ceiling tiles, 1/2″ thick which is EXACTLY what like a pontoon segment would be like. 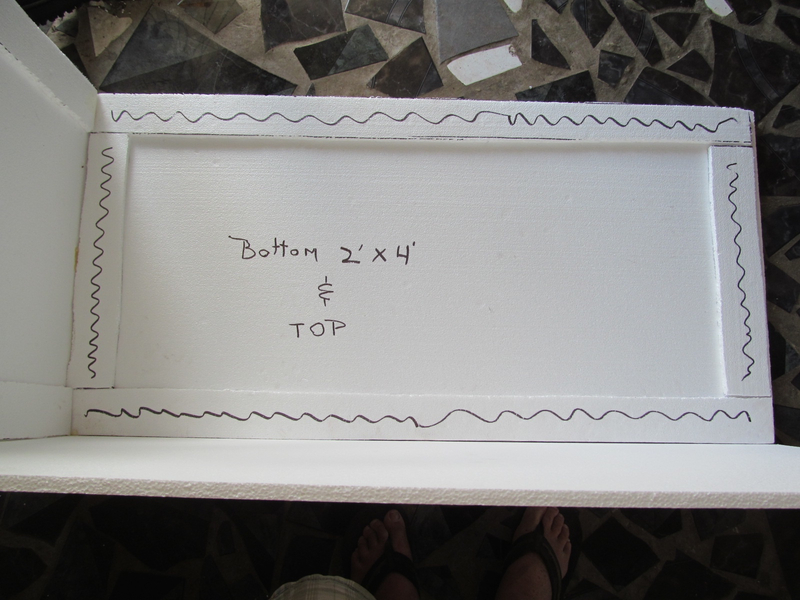 (I’ve since decided that the bottoms of each segment should be 3/4″ thick instead of 1/2″. Using a hot-glue gun to assemble the pieces (Elmer’s School Glue took too long to dry and needed constant pressure to stick together, and contact cement INSTANTLY melts styrofoam) this is what I came up with. Not only did this help me to visualize the building process, I found out that certain things had to be inset from an edge to accommodate other pieces. Those end pieces that stick up above the pontoons are where the 2 X 6 cross beams will attach the pontoons to form a catamaran structure. End to end each 4′ section will have a one-inch-thick attachment point. Bolted and epoxied they should be strong enough to be able to move the boat without a problem. So, diddling around some more with SketchUp, and getting better at it all the time though still having to try something, discard it and do it over again, I came up with these ideas. This is what a pontoon would look like. That square thing in the bow would be a hatch so I could use those segments to store anchor line and fenders. What Good Are Plans If You Can’t Change Them? I’ve had problems sleeping, lately. I get up in the middle of the night to take a whiz and can’t get back to sleep because variations of the shanty boat build whirl around in my mind. I thought about filling milk crates with empty 2-liter plastic bottles and then found out there’s only one dairy in the whole country that uses them and they won’t sell them. Using other kinds of containers to hold the bottles are no real answer to the problem, either. In any case, I would have built a plywood pontoon around them. So I got to thinking about using foam flotation. I found a place that sells open-cell foam ceiling tiles and could buy enough of them to provide, literally, tons of buoyancy. The problem with them is each 2’X4′ panel is only 1/2″ thick. Also, open-cell foam, I discovered from rummaging around on line when I couldn’t get back to sleep, will absorb water over time. I’d also have to find a way to keep the 35 sheets that came in a bundle together. Closed-cell foam doesn’t absorb water. There’s only one place in all of Panama that sells closed-foam sheets. The sheets are 4’X8′ and 4″ thick. They cost $100 each. I’d need 24 sheets to get the size and amount of buoyancy required for what I have in mind. I’m NOT spending $2,400 for floatation. 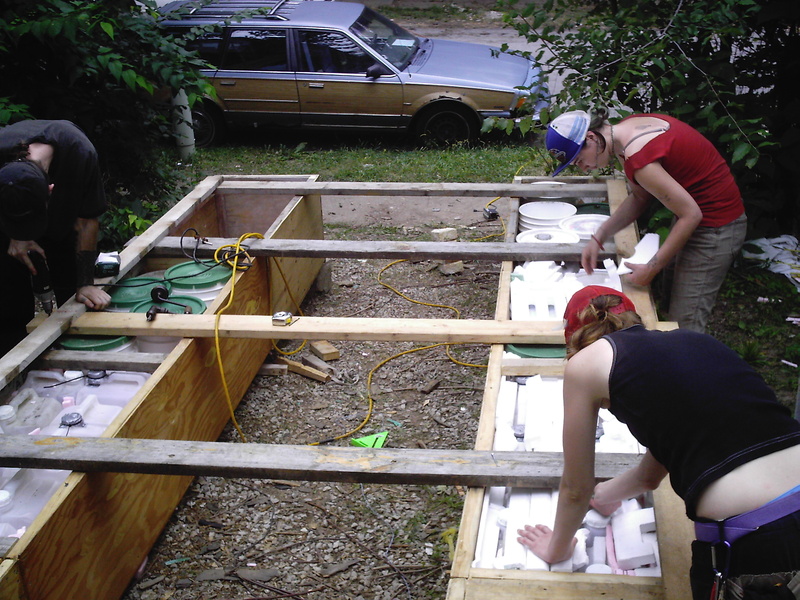 So, I’m looking at a site that shows some people building pontoons and stuffing it with foam. As you can see in the bottom pic they’re using a combination of bottles, 5-gallon pails and foam. They also mentioned in their story that they weren’t making the pontoons water-tight because they were making a single river trip and the shanty wasn’t for long-term use. The foam isn’t providing any buoyancy of its own. None at all. What it’s doing is providing potential buoyancy should the pontoons be breached. Well, I intend on making my pontoons watertight using a combination of glues, epoxy filets, and glass over wood. I also plan on building the pontoons in separate 2’X2’X4′ sections. They’d be easy for an old geezer like me to build and move around than building two long 20′ or 24′ pontoons. These segments would, of course, each have closed ends so that a breach in one wouldn’t flood the whole pontoon. Then I would fill them, like seen above, with a collection of discarded bottles. So, we’ll see if sorting this out in the daylight will help me sleep through the night. Well, there are a lot of reasons I don’t want to do that. One, I don’t really want to go back to the States even to visit. People around here often ask me if I don’t miss my family and friends up north. Well, sure. But if I travel some place I want to go to somewhere I’ve never been before. I don’t need to go visit those people up there. I KNOW what it looks like where they live. They should come down HERE and take part in the adventure of a different country and culture. But getting back to the theme of this post. One of the big disadvantages of powerboats and sailboats as live aboards is the DRAFT. My lovely Nancy Dawson which I lived on for nearly six years drew 4′ feet. That meant that I needed to be in AT LEAST four and a half feet of water and also take into account the tidal range. For instance, over here around Boca Chica where I’d like to be, the tidal range is as much as 19 feet! Take a gander of these sport fishing boats at Boca Chica…(By the way, there are MANY world record catches off the shores in this area). The boat I ran over in France, after we changed the old, short-weighted wing keel which made the boat dangerously unstable for a spade-type keel drew over TEN FEET!!! Because of this great tidal range (it’s only about 3′ over in the Bocas del Toro area) if you’re in a sailboat with a keel or a power boat where the props and rudders hang below the level of the keel, you have to be anchored quite a way from the beach in order to stay afloat or pay an outrageous fee for a dock at a marina. With a shanty boat you can choose from a couple of options. You could hang around, see where the low tide line is and anchor yourself just off it and walk ashore since your boat will only have a draft of a foot or so. Of course, six hours after you left it will be high tide and you’ll either have to wait for the tide to fall or swim out to your home. OR, if you’ve built your boat sturdy enough, you can go inshore as far as possible and “take the ground” as they say if you’ve found a nice protected spot where there isn’t much wave action to bounce you around as the tide drops. I’ve live around David (DahVEED) Panama for nearly six years and I’m STILL trying to figure my way around here. Not having a car I naturally depend on the buses (very good) and the taxis (ubiquitous) to get around. When someone else is always doing the driving, and you’re always going on the same route you don’t pay much attention to where you are. Yesterday I wanted to go check out a Home Depot-type place in David called Cochez which was advertising some styrofoam-type 2’X4’X5/8″ drop ceiling tiles at a cheap price that might be used as flotation for the shanty boat barge I’d like to build, and then do some shopping at the Romero market in San Mateo. The yellow stick pin (left center) marks the beginning of red line in the pic where the bus turns off the Inter American Hwy. to go into town and shows where I go shopping at Romero. It also shows the Cochez store (upper center). I had to take a taxi from the stand at Las Brisa to Cochez ($1.25). The guy at Cochez said they were practically out of the tiles and he didn’t know if they were planning to get more in, and if they DID, they certainly wouldn’t be that cheap the next time. He told me that THEY actually ordered the tiles from a place called PREMIUM CENTER, and that I should try there. So I went out into the heat of the day and flagged down a taxi to take me to Premium Center. It couldn’t have been very far away because it was also just a buck and a quarter fare. I saw the stuff they had and found out that the amount that I’d need to float a good-sized pontoon boat would cost me less than $400. At this point, though, I’m thoroughly lost. I don’t have a clue where I am, but my hips are aching like crazy so I decide to postpone shopping until today (Friday) and I flag down another cab to take me to the local KFC (sometimes, when you’re living in foreign country you get these strange gustatory cravings that can’t be explained or ignored). Besides, it was near an area I knew and could reorient myself geographically. While the sheets that Premium Center had in stock could be adapted to what I want to do there are naturally a lot of questions that you remember to ask when you’re sitting on the bus on the way back home. So I decided to go back to Premium Center and ask more questions. But before I went I looked on line to see where they were located in relation to Romero so I could do my shopping before the weekend. Guess what??? They’re a lousy FIVE AND A HALF BLOCKS APART!! !